World stock markets tumbled Monday, with Hong Kong's key index sinking nearly 5 percent, as downbeat comments from major U.S. banks and mounting woes at American auto giants undermined recent optimism about economic recovery. The retreat followed a sell-off Friday on Wall Street where investors booked profits on the Dow Jones industrial average's 21 percent gain over 13 trading days. Data showing a dip in U.S. personal incomes and a slowdown in personal spending were reminders that the world's largest economy and its banking system remain troubled. Investors in Asia were also unnerved by reports that the chief executives of JP Morgan Chase & Co. and Bank of America Corp. both said business conditions had got tougher since they reported being profitable for January and February. "The comments from these two banks show that problems in the U.S. financial sector aren't over and that's negative for sentiment," said Castor Pang, an analyst at Sun Hung Kai Financial in Hong Kong. "Investors are also cautious before U.S. employment data this week. If the unemployment rate continues to rise that will be a problem for the U.S. and for stock markets in countries like Japan that rely on the U.S. economy," he said. Japan's Nikkei 225 stock average sank 390.89 points, or 4.5 percent, to 8,236.08, and Hong Kong's Hang Seng slid 663.17, or 4.7 percent, to 13,456.33. South Korea's benchmark was down 3.2 percent while markets in Singapore, Taiwan, and India fell 3 percent or more. As European trading got underway, Germany's DAX was down 3.7 percent, Britain's FTSE 100 shed 2.5 percent and France's CAC 40 lost 3 percent. U.S. stock futures pointed to more losses Monday on Wall Street. Dow futures fell 187, or 2.4 percent, to 7,575 and S&P 500 futures were off 23, or 2.8 percent, at 793.10. Adding to the gloom in Asia, data released Monday in Japan showed that industrial production in the world's second-largest economy fell 9.4 percent in February as the sharp slump in global demand continued to paralyze the nation's factories. In Tokyo trade, shares of automakers fell after the White House said ailing automakers General Motors and Chrysler had not submitted acceptable plans to receive billions more in bailout money, increasing the odds the two American auto giants will eventually file for bankruptcy protection. Japanese automakers have said the possible collapse of major American automakers would hurt them as well by putting pressure on U.S.-based car parts suppliers. Potential job losses in the U.S. would also weigh on consumer spending. Toyota Motor Co., the world's largest automaker, fell 3.7 percent, Honda Motor Co. shed 6.7 percent, and Nissan Motor Co. dived 7.7 percent. A rising yen sent tech shares broadly lower. Sony Corp. declined 7.4 percent, Sharp Corp. lost 5.1 percent and chip maker Elpida Memory Inc. plunged 12.2 percent. Financial shares were also weak in Asia. In Seoul, KB Financial Group was down 6.5 percent and Mitsubishi UFJ Finance dived 8.8 percent in Tokyo after being downgraded to "conviction sell" from "neutral" by Goldman Sachs analysts who cited rising credit and equity losses. On Friday, the Dow Jones industrials fell 148.38, or 1.9 percent, to 7,776.18. The Standard & Poor's 500 index fell 16.92, or 2 percent, to 815.94 and the Nasdaq composite index dropped 41.80, or 2.6 percent, to 1,545.20. In oil markets, prices tumbled to below $51 a barrel as investors cashed in on recent gains, and in tandem with losses in regional stock markets. Benchmark crude for May delivery fell $1.86 to $50.52 by midafternoon in Asian electronic trading on the New York Mercantile Exchange. The contract dropped $1.96 to settle at $52.38 on Friday. 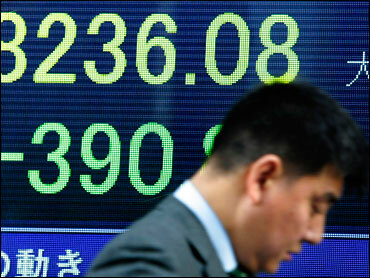 The dollar fell to 96.46 yen from 97.84 yen late Friday, while the euro dropped to $1.3199 from $1.3288.